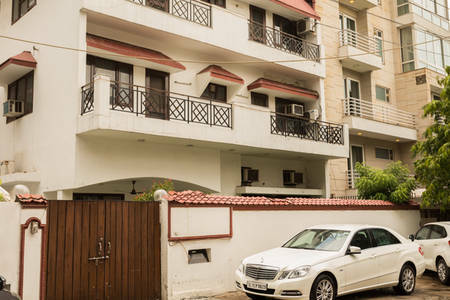 Welcome to our home in the Heart of Delhi-Defence Colony. 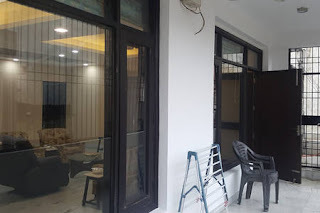 Not only is Defence Colony centrally located, it has a pulsating life of its own which Delhi-ites and Tourists alike desire to savour and experience. This welcome book is intended to help you get acquainted with the area and our home. We've downloaded our 10 years of area knowledge for you to enjoy! Favourite restaurants, Ancient Monuments with their history and stories, The Seat of the Government, Temples and Mosques, and more. Along with our area guide you'll also find everything you need to know about our home. From air conditioning to the hot water availability. You will find a bound copy of this guide in the apartment, which you are welcome to take out with you during your stay so you needn't print this out. 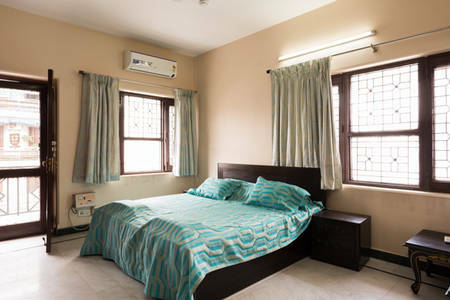 We have sought to equip our home to a high standard and to anticipate your needs by providing all the things you might want for a luxurious stay. Hair dryer, Towels and Steam Iron are provided as standard and a washing machine is available so that you don’t have to worry about luggage restrictions. WE always want to have a wonderful holiday and we want that for you too. We believe that when you are here this is your home for however long you are staying and that you will be relaxed, comfortable and happy. The service is provided for your enjoyment but you are responsible for safe and appropriate use and complying with all laws. If there is any loss of service please contact us. We provide 1.0GB data free for each day of stay. The JIO FI router will be handed over to you along with the Room Keys. You may hand over the same back to us along with the Keys at the time of Check Out. There will be small basket containing some biscuits and chips. Please help yourself . These are complimentary. Check-in time is 12 Noon. We can sometimes arrange an early check-in so please contact us if you will arrive early and we'll do our best, without any promises! We suggest you refer to the section on what to do if you arrive early - there is plenty to keep you entertained! You will find Water, Coke, Limca some Bread Butter and Cheese. We understand that some of you will be traveling without a car. In this case finding us is pretty simple! If arriving from the airport /Railway station please take an Uber or Any Prepaid taxi for C-570 Defence Colony New Delhi. If arriving by Metro get off at Lajpat Nagar Metro Station, take the Defence Colony Side exit, go down to the road level and walk for 5 minutes through the DDA Office Complex, Block F Defence Colony Market .This market is also known as Moolchand Flyover Market . Please call us the first time and we will send somebody to guide you and also help with your luggage. Optional opportunity to add any specific inventory check you or your housekeeping will do on check in. The Car may be parked inside the main gate in the driveway. - ensure the air-conditioners are switched off. - leave the key with the caretaker/property manager/office/host. We hope you had a wonderful holiday and wish you safe travels back home. We'd love to see you again next year! Check-out time is strictly 11am. Should you require a later check-out we will do our best but you need to let us know beforehand. If we have guests arriving that day it will be almost impossible to offer a late check-out due to the cleaners needing to prepare for those guests. You will find the house clean on arrival but please let us know if you are not satisfied. There is a daily cleaning service. Please let us know what time you will like the cleaning to be done, 8am or 12 Noon. After you depart our cleaners will perform that for the next guest. They have a key and will access the house at some point during the day, but not before 10am. If you need a cleaning service more often, please let us know and we will arrange this. An extra payment will apply. Optional opportunity to add any specific inventory check you or your housekeeping will do on check out. Defence Colony is an affluent locality situated in central South Delhi, India, built in 1960s for ex-defence service people. Today, Defence Colony market is home to around twenty restaurants and coffee shops, besides high-end shops. 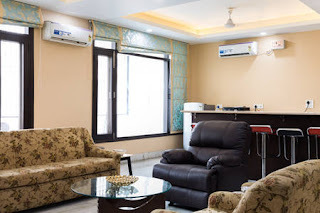 Besides its central location from most parts of the city of Delhi, the locality is immensely popular among all Delhi Residents (NCR) and Foreigners for the exotic varieties of cuisines that it has on the Menu’s of many restaurants in Defence Colony. Historic monuments: Close to the main Defence Colony market inside a roundabout, stands the octagonal tomb of Shaikh Ali, known as "Gumti of Shaikh Ali". Built in the 15th-century Lodhi dynasty-era, near the historic area of Kotla Mubarakpur, it housed two graves inside the tomb till early 20th-century, which are now long gone. The tomb houses the Defence Colony Welfare Association (DCWA) office, since 1960. 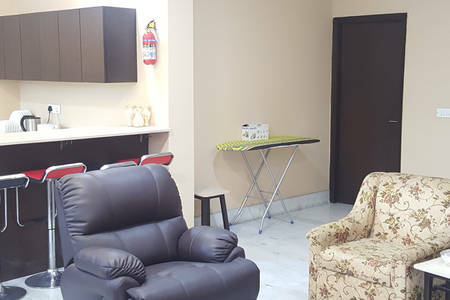 Getting there: Defence Colony is accessible by means of public transport including autos, taxis, buses as well as the Delhi Metro, which commenced services adjacent to the area in October 2010. Thus, if you are looking to get to Defence Colony by the Delhi Metro, hop off at the Lajpat Nagar station and cross the road using the overhead bridge as Defence Colony is on the opposite side of the road. There are many parks in Defence Colony, the roads are wide and tree lined and unlike other parts of Delhi Defence Colony is not overcrowded. Many guests will arrive before the designated check-in time. The good news is that there is plenty to do. We often suggest that guests visit the grocery store and do a small shop. That will give you more time to relax once you've checked in! There are also a few good restaurants for lunch so why not relax and enjoy some of the local food! Our home has the benefit of 100% air conditioning. There is one AC in each Bedroom and Two ACs in the Lounge. All are operated by the Remote Controls provided. Please ensure that all windows and outside doors are closed whilst the AC is running to ensure it operates to its maximum efficiency. We recommend a setting of 24C which we find keeps the place sufficiently cool. Our home is equipped with ceiling fans to help keep you cool. Each fan is operated via a Switch and Regulator. We provide Electric Oil Filled Room Heaters in Winter. We recommend a setting of 24C which we find keeps the place sufficiently warm. All manuals for the electrical equipment and appliances are in the middle draw of the unit to the left of the sink. 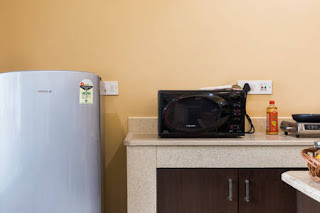 If you desire to do serious cooking during your stay you can install the Gas Burner and the Gas Cylinder. Please keep door open when you do the cooking. Our Mr Ajay will also be able to help you with the installation. For you to enjoy a cup of tea or coffee. You should not need to adjust any settings. If you run into any difficulties (e.g. it's not cooling efficiently) please let us know. The Microwave Oven is combined with a grill. When grilling please leave the door open. We have a washing machine located in the rear balcony. utility room next to the kitchen. There is a supply of detergent for your use. To operate the machines, simply select the program you want, place the detergent in the tray, close the top, and hit start.The clothes can be spread out to dry on the clothes stand. The Steam iron and stand are kept in the cupboard in the 2nd Bedroom. We have one TV in the Lounge -Panasonic and another in BR No 1 Samsung. The DTH is TATA Sky. All channels are available in both TVs. We understand that sometimes accidents happen! Should you break anything please let us know immediately - if it's minor we usually won't charge. If it's a larger issue (e.g. the TV screen!) we would like to agree the cost with you before you leave to avoid any issues later. Thank you! There are two torch in the apartment . Please note their location. Power outage is rare in Defence Colony and does not last more than 10 minutes. 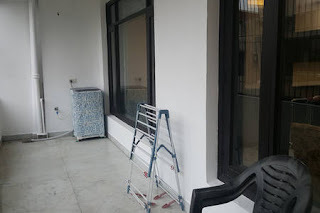 The fire escape is through the Rear Balcony steel gate. The key is kept in the aprtment. Please ensure the gate is securely locked at night and the location of the key is noted. People stayimg after 1130 PM need to submit copy their Govt Issued ID and pay charges as applicable. The Apartment is not pet friendly but you may get a well trained dog-toilet trained. Government Rules prohibit loud music after 11pm. Somtimes the cops land up. You may smoke in the Front or Rear Balcony. Please do not drop the stubs on the floor. they will choke the rain water drains leading to flooding in your apartment. Emergancy exit and fire escape are located in the Rear Balcony. Carefully keep note of the Keys location. For emergency services please immediately call 100. Do not delay if you feel an emergency situation has arisen. besides you can also call Rajeev, sudha or Ajay. The Fire Extinguisher is mounted on the wall near the Kitchentte. Please state very clearly to your guests where they can find the gas shut-off valve and how they shut it off. Please state very clearly to your guests if you have a smoke and/or carbon monoxide detector. Explain where it is and what the warning signs will sound like. Please also let them know, in the event of a power outage, if the devices have a battery back-up and how that will sound if it fails. BOOK AIRBNB APARTMENT NOW The Ideal New Delhi Accomodation. Please keep all doors properly locked before going to sleep. Do not open the door for anybody at odd hours without confirming identity. On the Ring Road . 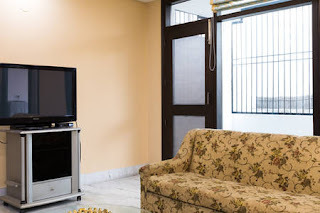 Uber And Ola cabs are freely avaialable around the Apartment.